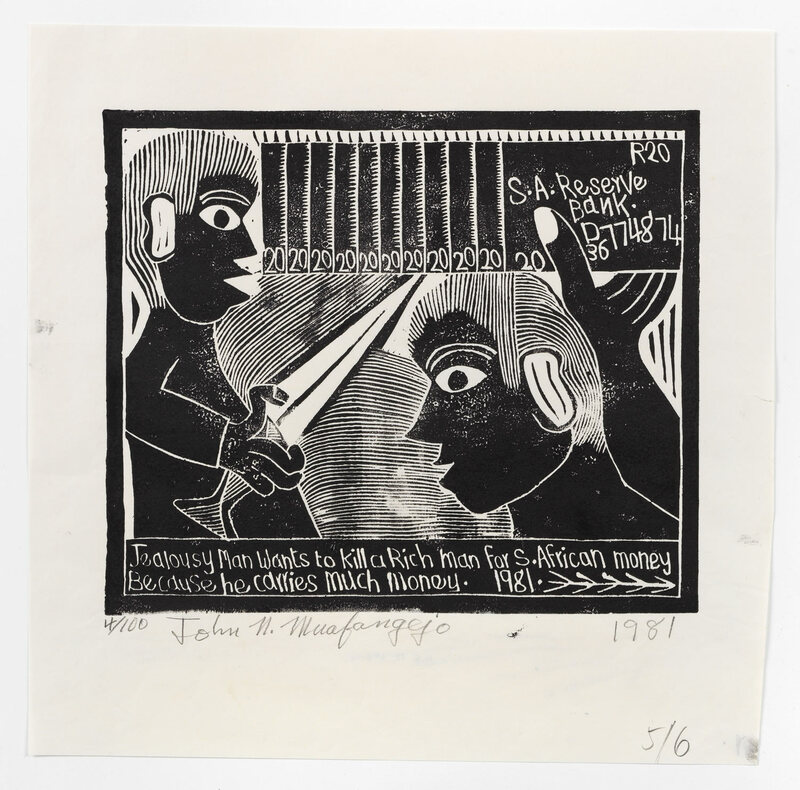 John Muafangejo, S.A. Reserve Bank or Jealousy man wants to kill a rich man for South African money because he carries much money (1981), linocut, 61 x 42.5 cm. Edition of 100. Photo: Wolfgang Günzel, 2015. Collection Weltkulturen Museum, Frankfurt am Main. “A Labour of Love” at the Weltkulturen Museum in Frankfurt features prints from the 1970s and 1980s by black artists in South Africa.1 The exhibition is co-curated by Yvette Mutumba, head of the museum’s Africa collection, and Gabi Ngcobo, a curator and artist based in Johannesburg, with the assistance of Cape Town–based curator Daniel Hewson. This interview took place at the Weltkulturen Museum on 16 June 2015. 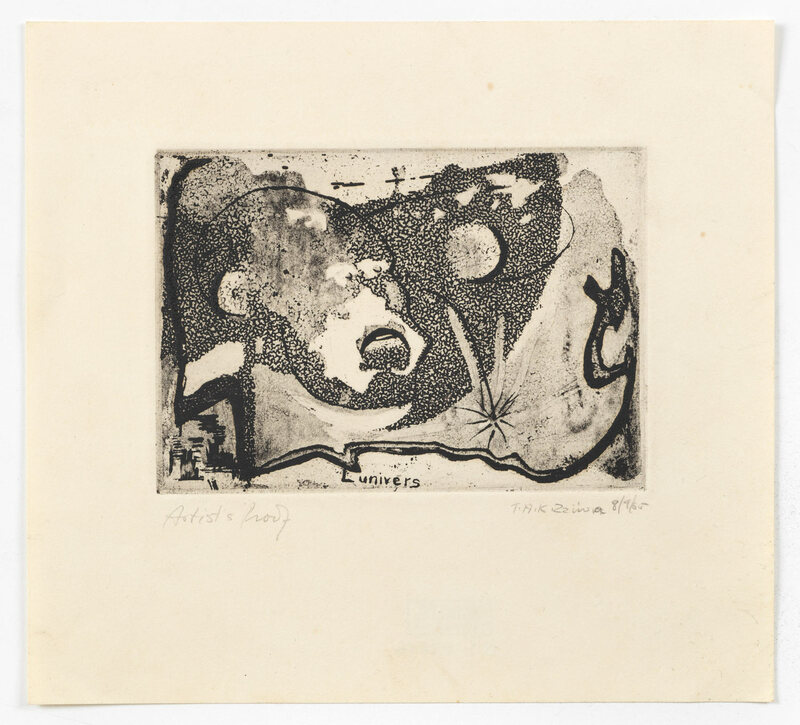 Due to printmaking’s bold character and economic means of production, it was the medium of choice for many South African artists, particularly from the second half of the 20th century onwards. Rorke´s Drift in KwaZulu-Natal, an art school for black artists run by Swedish missionaries, became a famous center of printmaking and produced work by prominent artists such as John Muafangejo. In addition to such relatively well-known work, “A Labour of Love” includes prints by artists such as Derrick Mdanda, who studied fine art at the University of Fort Hare (the only tertiary institution available to black students under Apartheid), and T.A.K Zziwa, about whom little is known. Daniel Hewson Please tell us about the Weltkulturen Museum’s collection of South African prints and how a museum in Germany decided to collect this work. Yvette Mutumba The South African collection is connected to the museum starting to collect contemporary art in 1974. At the time, at least in Europe, neither art institutions nor ethnographic museums were interested in non-Western contemporary art. Dr. Johanna Agthe, the curator for the Africa department, decided to start a contemporary African collection and the director of the museum, Professor [Josef Franz] Thiel, agreed there should be a focus on collecting contemporary art. He commissioned people who had various affiliations with the African continent to acquire contemporary artwork from different regions; one of these was a German pastor, Hans Blum, who had lived in South Africa as a minister and a missionary for about 15 years from the early 1960s until the late 1970s. During this time he became interested in contemporary art and was also involved in the anti-Apartheid movement and supportive of the black communities and the black congregations. In this context he began collecting works by only black artists. When he came back to Germany in the early 1980s he started to exhibit his private collection of works—mainly prints by black artists—in the context of different congregations or churches in Germany to create awareness about Apartheid in South Africa. That was in 1986. It is important to emphasize this date because it was the absolute height of the State of Emergency in South Africa.3 It must be clear that becoming an artist as a black person in South Africa was a political statement in itself, because black artists didn´t have any ability to study at major art schools or universities and had no means of exposure. Blum wanted to support them in terms of economics but also in terms of visibility. He ended up buying about 600 works, and the majority are prints. 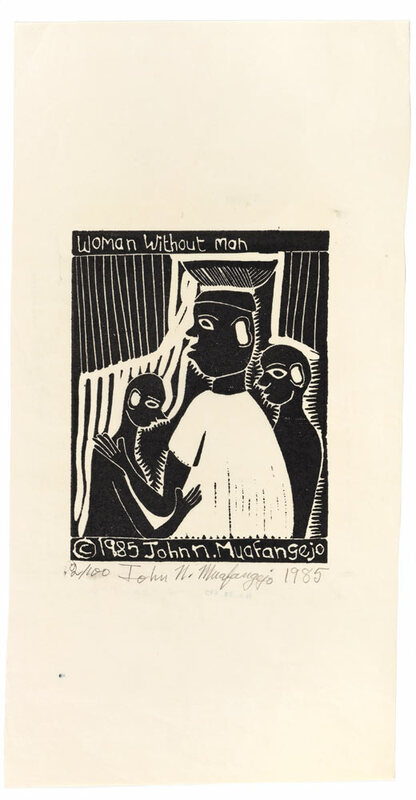 DH One of the prints I would like to discuss is John Muafangejo’s Jealousy man wants to kill a rich man for South African money because he carries much money, which is quite different from his best-known work in its approach and subject matter. John Muafangejo, Woman without man (1985), linocut, 61 x 27.5 cm. Edition of 100. Photo: Wolfgang Günzel, 2015. Collection Weltkulturen Museum, Frankfurt am Main. YM When we talk about Muafangejo´s prints we usually talk more about the “design-y” aspects or how he utilized these more organic forms in his works, but you don´t see that here. It is a clean and clear work and he´s also using a different kind of text. This is a different kind of storytelling as it´s not referring to any theological themes or any traditional stories or any of his personal experiences. It’s interesting in the context of the time and place where this work was produced to talk about economics—it´s not really talking about a black and white issue. The theme is picked up throughout the exhibition—the whole economic aspect of producing works in a time of political stress, not only because the artists didn´t know how they would make a career, but also what it means that a lot of the works were bought by Blum for very little money and today they have a considerably higher value. DH So often prints are made in situations of duress. 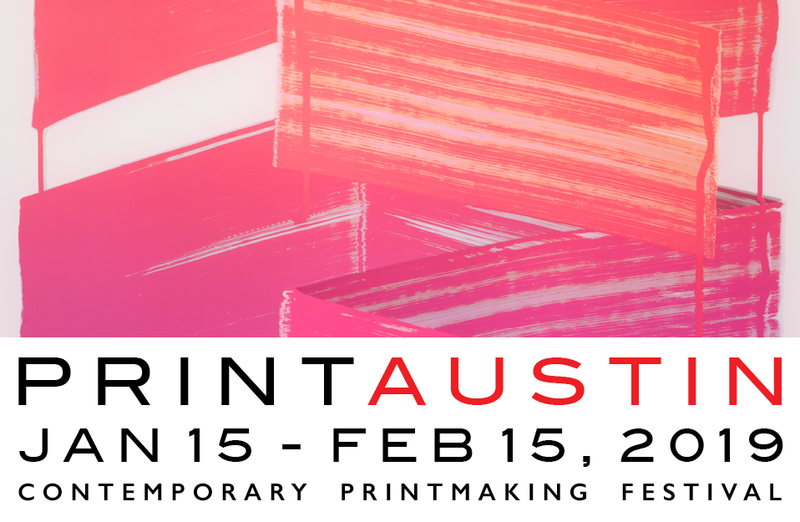 YM Print is, on the one hand, more complicated than a quick drawing with a pencil or ink, but on the other it is very favorable—especially if you have a political statement—as you can multiply the work rapidly and it is easy to distribute. I think you can be explicit in prints, so if you have a statement it’s easy to have clear outlines and to have a very accessible image sense. DH It is direct, condensed and precise. YM Although it´s maybe not as cheap as using your everyday pen it’s still a rather cheap medium if you compare it to oil or acrylic on canvas or sculpture. Especially in tense political situations, often artists don´t have the economic means to produce any other kind of artwork. 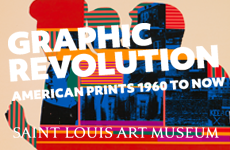 It was mainly through missionaries’ trying to provide alternative ways to educate artists that printing became one of the main mediums because it was inexpensive. There´s a direct connection between the political aspect and the outcome, even if a couple of the artists were not explicitly saying they were activists. In itself it was a political act, being part of these workshops. Becoming a black artist was a striking step because, according to the Apartheid government, you were not supposed to be one. DH And there was no way of building your career because of the situation. DH There is another Muafangejo called Woman without Man, printed in 1985. YM This print is special because it’s different in terms of style5 and how he produced it, but it’s also interesting because it brings in a specific topic, which applies not only to his work but to the whole collection and to the time, which is the absence of women. It’s a striking phenomenon that in the 1980s there were hardly any female [black South African] artists. When I talk to other artists who were active in that time like Sam Nhlengethwa or David Koloane, they always say that it is related to the fact that during that period women had to deal with other problems so they couldn´t see how they could become an artist. As we mentioned earlier, [if you were black, you made] the decision to become an artist without knowing that you will ever have a career. For women, they would never see that possibility because they were required to provide a home and a family. 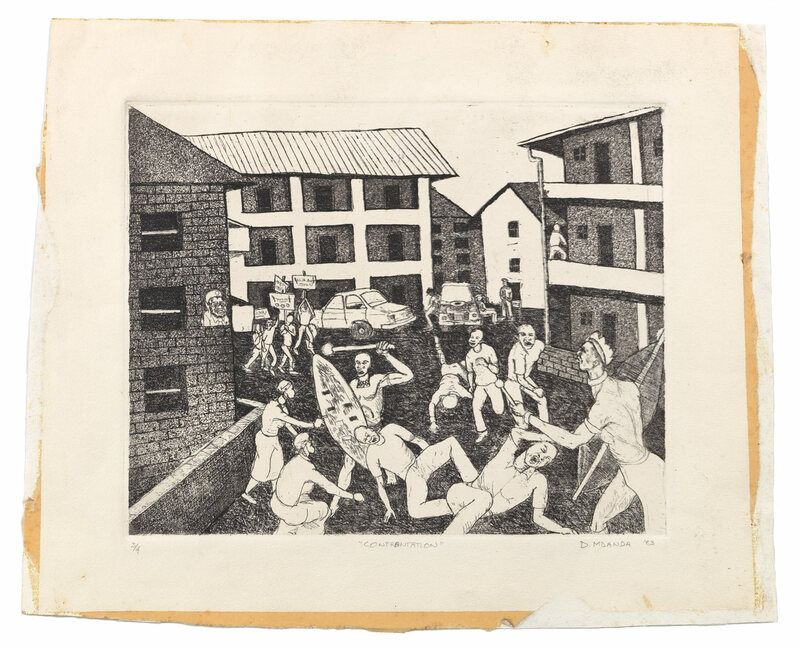 Derrick Mdanda, Confrontation (1983), etching, 24.5 x 30 cm. Edition of 4. Photo: Wolfgang Günzel, 2015. Collection Weltkulturen Museum, Frankfurt am Main. DH What are some of the debates that you hope to open up in the exhibition? YM One feature is to show a mixed collection of strong works: we have works by big stars but we also have works by artists who have not had the same kind of visibility, not even in South Africa. Another stems from the fact that this collection was built up in 1986 in a very political framework, not only because it was a time of high tension in South Africa and these were works by black artists but also within Germany where no other museums were doing this. It was still before the so-called global turn in 1989.6 Germany had a complicated relationship with South Africa. There was an anti-Apartheid movement in [West] Germany, but there were also people in the German government and lots of big companies that had strong relationships with the Apartheid government. At the same time, in East Germany there was a strong affiliation with anti-Apartheid organizations. Blum said that when he curated his first exhibition he met people from the solidarity committees in East Germany and they wanted to have the exhibition first because it was so political. DH To have it in East Germany first, not West Germany? YM He showed it first in West Germany because he lived here, but when he was in East Germany he met these solidarity committees who were concerned with international communism and in this context propagated solidarity with suppressed peoples such as the black population in South Africa. They were interested because the work was so political, because it was anti-Apartheid. The only reason they didn´t take it was that there were works by Charles Nkosi and others that had theological themes, and they said it was too religious for them to show. What we are really trying to do with the exhibition is find different kinds of readings of the art—I think that´s what we owe to the works because they are more than political statements despite being produced in a specifically political framework. You can easily fall into the trap of pretending every artist is basically producing the same type of political work that is addressing Apartheid inequality, which is simply not true. It’s not just differences in styles, there are also other narratives that come with the subjective way artists produce art. DH The next print is an etching by Derrick Mdanda titled Confrontation. YM This is a good example of every artist having different styles or narratives that shouldn´t be stuck under the umbrella of political topics. At the same time he is addressing issues literally in comparison to Muafangejo. It seems like a very one-dimensional situation at first because you just see these people fighting, but on further investigation [you see] the architecture, the traditional shields, the “European” clothes; all these aspects refer not only to modern times versus tradition but also to the modern times that were brought in by missionaries, which is connected to the whole Apartheid system. There are a lot of narratives in a very small, simple-looking work. T.A.K. 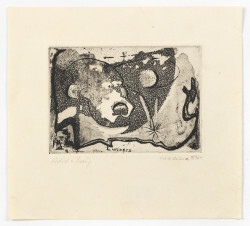 Zziwa, L´Univers (1965), etching, 22.3 x 20.5 cm. Artist’s proof. Photo: Wolfgang Günzel, 2015. Collection Weltkulturen Museum, Frankfurt am Main. DH This work also confirms the idea of Blum collecting broadly and how there were so many other printmakers producing work different from the standard Rorke´s Drift style. There is another small print that is quite unusual by T.A.K. Zziwa, called L´Univers. YM It is a print with nothing you would recognize in terms of from what “school” the artist came from, not only because of the technique but because of the abstraction and the theme of its title, “universe.” You can read many things into it. It could be theological, it could also be political. 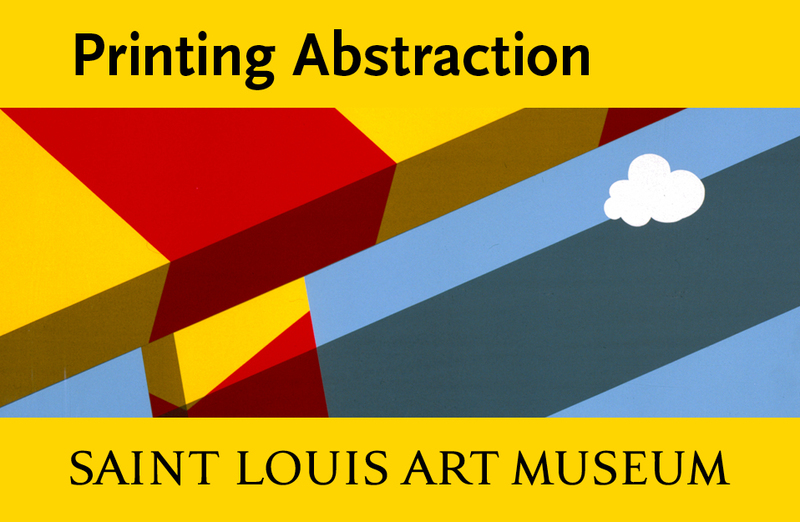 It´s so abstract that you might be able to see the profile of a head, but some viewers may see something completely different. Works from that time are not often abstract. This print is very much an exception in the collection. It is not figurative at all but still has a lot to say. DH Sam Nhlengethwa, who is a well-known South African artist, is going to be doing a residency at the Weltkulturen Museum in July 2015. 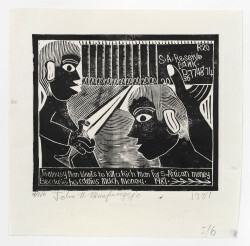 Some of his work is contained in the collection acquired by Blum in 1986. What are you hoping will result from this collaboration? YM With Sam it’s important to still have a voice from that time. He produced important political work; it makes sense to invite someone who’s a witness of that time to come back and revisit the works that we have here in the collection in the framework of a German museum. You don’t have it necessarily in South Africa: so many works from so many different artists.